A breakthrough article this week in the science supplement of the very respectable newspaper NRC Handelsblad. The topic is global cooling, the investigator is Bas van Geel, palynologist (yes, I had to look it up too) at the equally respected University of Amsterdam and the suspect: the sun. Van Geel with colleagues investigated a well-known episode of global cooling called the Homeric minimum taking place around 850 BCE and reported about it in Nature Geoscience (DOI). They investigated the annually laminated sediments of Meerfelder Maar lake and measured among other things the concentration of beryllium-10 which was found to be especially high in this period. The production of this isotope is inversely related to the number of sunspots (high solar activity interferes with cosmic rays) and hence according to van Geel, the Homeric minimum results from a decline in solar activity. The newspaper article explains that the difference in total radiation between an active sun and an inactive sun is only 0.1% but that the variation in UV radiation is more relevant because it controls ozone levels which in turn control stratospheric temperatures. You are still with us? Interestingly van Geel & team in their Nature report are reluctant to extrapolate their findings to the current global warming/cooling event but when it comes to the news media (the aforementioned NRC but also at least one other Dutch newspaper), van Geel is very opinionated: the IPCC underestimates the effect of solar radiation because it is more difficult to measure than things like carbon dioxide concentration or water vapor. For the last 10 years the planet refuses to warm up and not coincidentally the current solar maximum is meagre at best compared to the previous one. But why this reluctance for an established hard-core scientist to state this hypothesis in a genuine article and instead turn to the news media to vent of steam? Fear of reputation damage? Intimidated by the opposition saying that it is a regional effect at best? Thus far the band of climate sceptics is composed of political activists, bloggers, and retired geologists. A contribution from an active main-stream scientist would be welcome. This blog is eagerly anticipating van Geel's next article. This sun/climate battle should be fought in the journals and not in the newspapers. There is only one way to find out if a reaction developed at a small scale really works and that is repeating the reaction on a big scale. Not milligrams, not grams but KILOGRAMS. Wenjie Li et al. of Boehringer Ingelheim Pharmaceuticals report on the pilot plant synthesis of cyclopropyl-aminopyridine-(L)-alanine dipeptide in a recent edtion of Org. Process Res. Dev. (DOI). 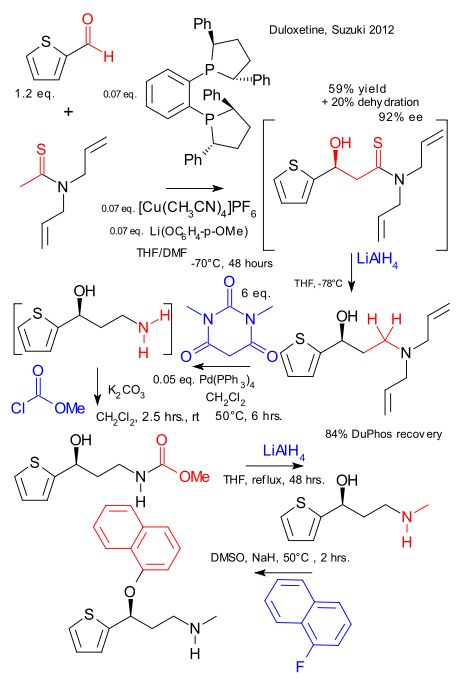 The key reaction is a Kulinkovich-Szymoniak cyclopropanation with starting materials titanium isopropoxide (unlikely C2 delivery agent), ethylmagnesium bromide pacified with ligand bis-2-(N,N-dimethylaminoethyl)-ether and 2-cyanopyridine in 2-methylfuran. So what does that feel like?, filling a 400 L reactor with 175 kilograms of an Grignard reagent? This reaction was quenched with lots of acetic acid and water to produce the free amine. 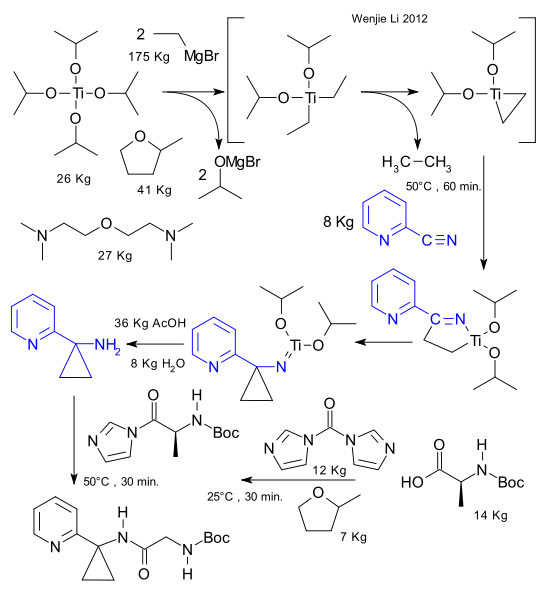 In the meanwhile in reactor number two the BOC derivative of alanine was itself derivatized with carbonyldiimidazole and the entire reactor content was then added to reactor number 1 forming the dipeptide. Big advantage of this procedure according to the researchers: only the derivatised amine can be separated from all the titanium and magnesium salts. Oil and gas company ExxonMobil is promoting its new and improved gasoline in a television ad that is accompanied by a website called fuelprogress.com. The company promises that the fuel is developed at a molecular level to clean up vital intake valves. The accompanying flash animation here gives us a 'molecular view inside the combustion chamber (in text) and a microscopic view (the voice-over) that should explain how the fuel actually keeps the engine parts clean. The secret is a higher octane rating but what are we supposed to see in the animation?. The molecular view icon is an oddly placed ammonia molecule or a methane radical? And what are these monoatomic, diatomic and triatomic molecules? The ugly brown color of the wrinkly blobs in the front magically turns yellow in the course of the animation so it appears the molecules themselves get a cleanup. Nothing is actually explained in this molecular view. It is a big hit in any chemistry class: the woosh bottle. Take a 25 liter polycarbonate water cooler water container, add 10 ml of ethanol or isopropanol (rubbing alcohol), rinse and then add a burning match. Amazing how little fuel can produce that much of an ignition. Youtube has dozens of clips with all sorts of variations. In a recent contribution to woosh bottle research researchers at the University of Dubuque report that contrary to expectation isopropanol does not just combust to water and carbon dioxide. Instead GC analysis reveals a host of hydrocarbons such as naphtalene and styrene. Main cause: the alcohol is added in excess and the combustion is incomplete. Also, a lot of the energy released in the combustion goes into vaporizing more alcohol thus slowing down the reaction. The researchers propose that the bottles should be discarded of as chemical waste because many of the chemicals they found are nasty polycyclic aromatic hydrocarbons. Please disregard this advice: the levels are in the microgram per ml range. The same researchers also advise blast shields to protect the students in class-room demonstrations. In 30 or-so youtube demonstrations in front of students from the age of 7 NOT ONE blast shield was spotted, this blog can report. And as for the incomplete combustion? That does not come as a surprise for the youtube researchers in video number two. According to these demonstrators using less alcohol rather than more gives a better display. The guys in video number 3 solved the problem of incomplete combustion: they made pure oxygen first in a potassium iodide / hydrogen peroxide reaction. Pure rocket science. Who: Yuta Suzuki et al. 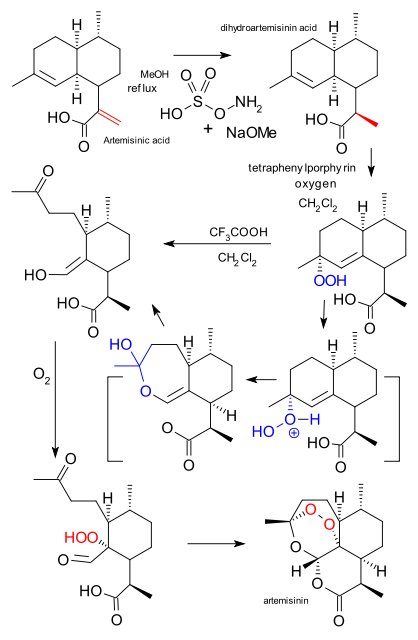 Key feature: enantioselective Aldol reaction. Current commercial product is enantiopure and based on kinetic resolution and recycling with mandelic acid. How: step 1: Aldol reaction of 2-thiophencarboxaldehyde with N,N-diallyl thioacetamide using duphos, tetrakis(acetonitrile)copper(I) hexafluorophosphate and the lithium salt of 4-methoxyphenol followed by organic reduction of the thioketone by Lithium aluminium hydride, step 2 : removal of the allyl protective groups by Tetrakis(triphenylphosphine)palladium(0) and dimethyl barbituric acid to the free amine, then acylation using methyl chloroformate, step 3: reduction of the carbamate group using Lithium aluminium hydride and finally nucleophilic aromatic substitution with 1-fluoronaphthalene using sodium hydride. The upside: clever duphos recovery (expensive), usually the presence of copper salts are in the way but postponing the recovery untill after reductive step loses copper salt as copper(0). Last year Alexander Grushow commented in The Journal Of Chemical Education that if it were up to him the hybrid atomic orbital (HAO) model would be abolished in favour of the molecular orbital model (MO) (see blog here) just as phlogiston theory some centuries ago. A long time nothing happened but in this month's issue we have no less that 5 replies and of course a Grushow rebuttal. Nivaldo Tro disagrees (DOI) and argues that valence bond theory must then be on the chopping board as well because it goes hand in hand with HAO theory. He appeals to the educational value: VB theory is halfway between a simple Lewis structure and complex MO theory. VB theory provides the first introduction for students to the notion that overlapping orbitals lower the overall energy of the electrons involved. As an aside Tro also notes that VSEPR theory (also favored by Grushow) cannot explain the rigidity of a double bond. Landis and Weinhold also disagree (DOI). Since when does VB theory not accurately predict the structure of methane? Natural bond orbital (NBO) hybrid orbital theory, according to Landis and Weinhold, can calculate the electron distribution (4 equal tetrahedral bonds) like the best of them. It can even tackle the methane photoelectron spectrum with two peaks in a 3:1 ratio if you remember that the spectrum is the result of electron excitation between methane and the excited states of the ionized molecule. More disagreement from Hiberty, Volatron and Shaik (DOI) who point out that mathematically any MO can be converted to a localised MO (LMO) describing a localised bond between two atoms. These LMO's look exactly like hybrid orbitals. Hiberty et al. also remark that only the hybrid model can explain the so-called bond transferability which explains why all C-H bonds in alkanes have the same bond length and why all acetylenic protons are acidic. Donald Truhlar also disagrees (DOI) and is making the same point as Hiberty: the total electron density picture can be build from molecular orbitals or from localised molecular orbitals. These orbitals do not reflect true wave functions and you need a bunch of them to create one. And finally DeKock and Strikwerda (DOI) note that in molecular mechanics molecules are also treated as a collection of localised bonds with atoms joined by springs. And where does this leave Grushow?. Apparently no one came to his rescue. In his rebuttal (DOI) Grushow argues that it was never his intention to abandon the hybrid orbital but that he merely proposed to remove it from entry level chemistry classes. It would inject the wrong ideas in students heads that lack the proper mathematical background anyway and after all only 5% of these students will continue in a chemical career. Well if that is the line of reasoning why advance to the level of VSEPR theory? Why not resurrect phlogiston theory for the other 95% and leave it at that? After all, this theory accurately describes phlogiston as a substance released during combustion. At some level around a stone-age camp-fire that is all you need to know about chemistry.